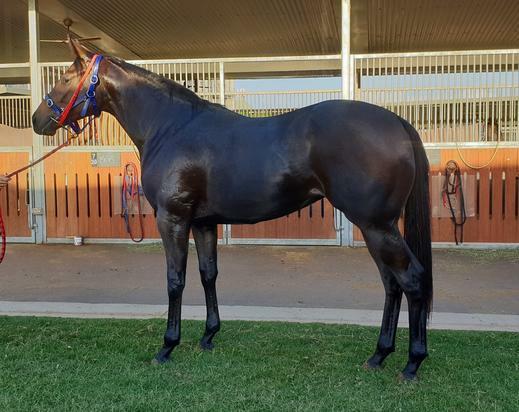 Shares are available for immediate purchase in this value for money filly, purchased by Kelly for $25,000 + GST, at the 2019 Gold Coast Magic Millions. By DAWN APPROACH, out ARISTOCRACY, a proven producer of winners, that just keep going down the page, at this price, she is sure to sell quickly! DAWN APPROACH (IRE) (Chestnut 2010-Stud Ire. 2014, Aust. 2014). 8 wins-6 at 2, The Two Thousand Guineas, Gr.1. Sire of 212 rnrs, 82 wnrs, inc. SW Madhmoon (Leopardstown Champions Juvenile S., Gr.2), Musis Amica, Second Generation, Haddaf, Mary Tudor, SP Bold Approach, Court House, Dawn Delivers, Fajjaj, etc. His oldest Aust.-bred progeny are 3YOs and inc SP Alyaasaat, Dawn Patrol, Gongs, Dawn Passage, Tahitian Dancer and of Condemned, Approach Discreet, Fairedu, Inflammable, Light My Day, etc. Tahlayla. Winner at 1100m in 2018-19, 2d SAJC Alan Sheppard Construction 2YO H.
Sea Jade (g. by Star Witness). 5 wins at 1200m, HK$5,757,900, HKJC Happy Valley Trophy, Choi Hung H., Centenary Gold Cup, Chengdu H., Inverness H., 2d HKJC Griffin Trophy, 3d HKJC France Galop Cup, Cha Kwo Ling H., L'Oreal Paris H.
General Wind - Kolombia (Sing.) (g. by All American). 4 wins at 1200m, 1400m, BRC Mount Franklin P., SCTC Skyharness H., Singapore TC Ninetyfive Emperor S., Hello Brisbane S., 2d Singapore TC Class 3 H.
Catalina Miss. 3 wins at 1200m, A$89,000, to 2018-19, BRC Canadian Club H., 2d BRC Dr Lilian Cooper 2YO H., Intrust Super 2YO P., GCTC Industry Awards Night P.
First Bid. 2 wins at 800m, 850m in 2017-18 in Aust. Eclair Sensation (g. by Street Sense). 5 wins to 1200m in Malaysia and Singapore, Singapore TC Aisa S., Class 4 H., Benchmark 53 H., 2d Singapore TC Kranji D S., Happiness S., Class 4 H.-twice, 3d Singapore TC Graduation S., Benchmark 67 H., Class 4 H.-5 times. Lordroh (g. by Lonhro). 2 wins at 1200m, 1300m in Aust. Diamond Angel (f. by Northern Meteor). Winner at 1000m in Aust. Ashfords Legacy (c. by Star Witness). Placed at 3 in 2017-18 in South Africa. BLUEBIRD THE WORD (Bluebird). Joint third top colt on The 1997-98 NZ 3YO Free H. 7 wins from 1400m to 2400m, NZ$351,325, A$86,600, Waikato RC International S., Gr.1, Waikato Gold Cup, Gr.2, Equine Professionals H., Counties RC Counties Inn H., Solid Gold FM H., 2d New Zealand Derby, Gr.1, WRC Thorndon Mile, Gr.1, VATC Sandown Guineas, Gr.2, Counties Cup, Gr.2-twice, ARC Great Northern Challenge S., Gr.3, 3d Waikato RC International S., Gr.1, Queensland Derby, Gr.1, Waikato RC Babich Wines H., 4th Waikato RC International S., Gr.1, QTC PJ O'Shea S., Gr.2, ARC Deutz Marlborough Cuvee S., Gr.3, QTC Metropolitan H., L.
MONTEROSSO (Dubawi). Champion Older Male in UAE in 2011-12 (Int.). 7 wins from 1600m to 2500m, £126,000, €37,499, 26,325,400Dhs in GB and U.A.E, Meydan Dubai World Cup, Gr.1, Royal Ascot King Edward VII S., Gr.2, Meydan Dubai City of Gold S., Gr.2, Newmarket Johns Practice H., 2d Newbury London Gold Cup, 3d Meydan Dubai World Cup, Gr.1, 4th Irish Derby, Gr.1, Meydan Al Maktoum Challenge Round 3 S., Gr.1. Sire. HAPPY GALAXY (Nadeem). 6 wins-1 at 2-at 1000m, 1200m, A$353,850, ATC Expressway S., Gr.2, MRC Zeditave S., L, ATC JB (Barry) Maher Memorial H., Hyland Race Colours H., 2d GCTC Magic Millions Sprint H., ATC Science in Sport 2YO H., 3d MRC Bel Esprit S., L, VRC Victorian Carbine Club 2YO P.
SILENT SEDITION (War Chant). 7 wins from 1200m to 1800m, A$1,177,150, to 2017-18, MVRC William Reid S., Gr.1, MRC Summoned S., Gr.3, Mannerism S., Gr.3-twice, SAJC Schweppervescence S., Gr.3, Bendigo Guineas, L, 2d ATC Coolmore Classic, Gr.1, SAJC Schweppes Oaks, Gr.1, MRC Cape Grim Beef Steaks S., Gr.3, Geoffrey Bellmaine S., Gr.3, Ladbrokes Cash In H., 3d ATC Coolmore Classic, Gr.1, VRC Hong Kong Jockey Club S., Gr.3, 4th ATC Queen of the Turf S., Gr.1, Moonee Valley Fillies Classic, Gr.2. Aristocracy (Danehill). Winner. See above. ROAD TRIPPIN' (Charge Forward). 6 wins from 1200m to 1600m, A$454,065, TRC Thomas Lyons S., L, Albury Guineas, SAJC Evright.com H., 2d SAJC Port Adelaide Guineas, L, 3d VRC Sires' Produce S., Gr.2, SAJC Penang Trophy, L, MRC (Mornington) Lord S., L.
CRACK A ROADIE (Charge Forward). Winner at 2, A$177,000, MVRC Inglis Banner 2YO S., RL, 2d VRC Maribyrnong P., Gr.3. WE'RE GONNA ROCK (Fastnet Rock). 5 wins to 1200m, A$598,888, VRC Bobbie Lewis H., Gr.3, SAJC RN Irwin S., Gr.3, VRC Fiesta Star H., SAJC McClusky Public Relations H., MRC Ammon Ra H., 2d SAJC Goodwood H., Gr.1, MRC Sir Rupert Clarke S., Gr.1, Toorak H., Gr.1, 3d MVRC Manikato S., Gr.1.